I’m a bit late on the updates today. Last week I tackled two reviews for EGMi. Shantae: Risky’s Revenge was a pleasant surprise on DSiWare, considering the volume of awesomeness being churned out on that platform is rather meager. It’s a nice mix of old school and new school that I found rather enjoyable. You can check out my full review in last week’s issue. 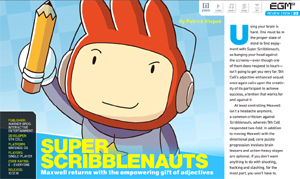 I also offered up a second take on Super Scribblenauts – a game I could barely pry out of my fingers once I started fiddling around with it. The wife and I both cracked out on this one big time, and I found the addition of adjectives and the other fun updates improve the gameplay. You can check out both reviews here at EGMi. 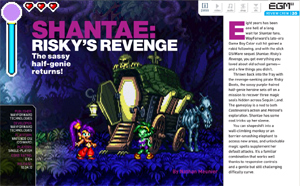 This entry was posted in EGM/EGMi and tagged ds, DSiWare, EGM, EGMi, Review, Shantae, Shantae: risky's revenge, super scribblenauts by nmeunier. Bookmark the permalink.